It is unfortunate that most churches or even individuals who have the power to heal any sickness on their own are ignorant of the power they possess to heal any sickness. God can heal the sick through you but there are certain rules and principles you have to follow before it can manifest.The purpose of this book is to expose you to the world of healing using the power of God. It is time to wake up and heal the sick. It is unfortunate that most churches or even individuals who have the power to heal any sickness on their own are ignorant of the power they possess to heal any sickness. God can heal the sick through you but there are certain rules and principles you have to follow before it can manifest. The purpose of this book is to expose you to the world of healing using the power of God. It is time to wake up and heal the sick. Looking critically at the above scriptures you will observe that Jesus Christ frown at sin. There is no way you can heal a sick person if you are committing sin. Secondly you must believe that you can heal. Please note that the Bible is very clear that every Christian can heal the sick and must heal the sick. You don’t have to be a pastor or General overseer, or a prophet before you can heal the sick. 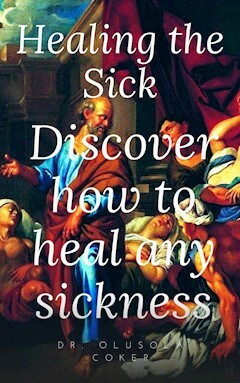 God has already given you the power to heal the sick. If you are a real Christian, you are a potential healer. According to the book of Mark 16:17,18 which says: And these signs shall follow them that believe; In my name shall they cast out devils; they shall speak with new tongues;They shall take up serpents; and if they drink any deadly thing, it shall not hurt them; they shall lay hands on the sick, and they shall recover.